Your dentist may recommend replacing part of a tooth that has been lost through wear and tear or decay with a filling. Fillings are made from a number of materials, and your dentist will discuss your options with you before starting treatment. If the damage is more extensive and a filling is not suitable, then you may need an inlay or onlay. This treatment is similar to a filling, but the worn area is replaced with a moulded piece made to exactly fit the affected tooth. Tiny cavities discovered during a regular check-up may be filled with amalgam or composite to repair the tooth and avoid further decay or damage. Amalgam (which is a grey or silver coloured material) works particularly well in molar teeth. Composite is a very similar colour to natural teeth and is sometimes used when patients are concerned that amalgam fillings may be visible following treatment. 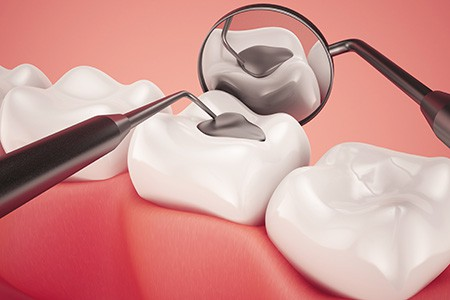 Fillings are placed and sculpted into your tooth to ensure you can bite properly after treatment. You must follow the care and advice recommended by your dentist so the filling is retained and your tooth remains healthy. If the area of decay or damage is extensive, or if the area needing treatment is in a tooth at the back of the mouth, an inlay or onlay may be recommended. An inlay is placed inside a tooth, whereas an onlay fixes to the outside and rebuilds the tooth shape. They can be made of metal, composite or porcelain. 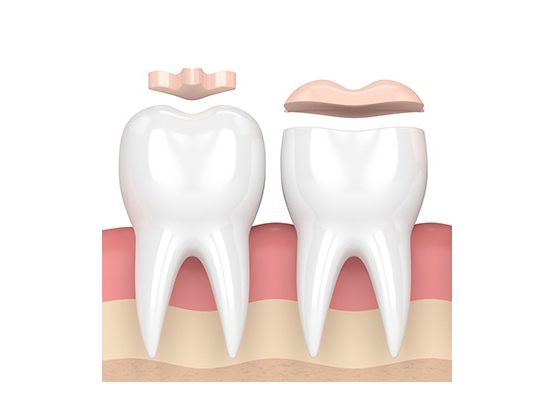 As with a filling, the damaged area is prepared, but then an impression is taken of the tooth using a mouldable material so a technician can build an inlay or onlay to exactly fit your tooth. Whilst it is being built, a temporary filling is placed in the tooth. When it is ready, your dentist will remove the temporary filling, fix your inlay or onlay onto your tooth and make small adjustments to ensure it is comfortable.